Despite recent advances in automated financial reporting tools, many CFOs still rely heavily on static spreadsheets for producing financial statements. 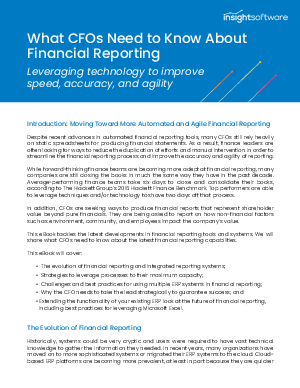 As a result, finance leaders are often looking for ways to reduce the duplication of efforts and manual intervention in order to streamline the financial reporting process and improve the accuracy and agility of reporting. To download this White Paper, please complete the following form.